Today I cleaned my room, and the bathroom, and maybe even part of the kitchen. If you know me at all, you know that means that I was planning on having company. Since we had two cars downtown, this guest and I drove separately back to my place. I was kind of rushing to make sure that I had cleaned everything that I wanted to be clean, and then I saw a distraction. About 1/3 of a mile away from my house, I noticed that there was a fire on someone’s lawn. There was another car pulling over, and I could tell that they would take care of it, but I wasn’t ok to just let that be it. I pulled over too, and the woman who was already on the lawn unscrewing the sprinkler from the hose, tossed it to me as she went to turn it on. I got all the obviously hot spots put out and then covered the rest of the area decently. The lawn does seem pretty dry, so we figure that some idiot had flicked their cigarette out of their window and it caught. So basically, I’m totes a hero and I’m really glad that Matt is quitting smoking so I don’t have to guilt him with how terrible smoking obviously is based only on this story. It’s not just about the individual’s health and the gross smell folks, it’s also for neighbor’s lawns. Oh, and I haven’t even mentioned yet that I did all of this in glitter heels? Totes did. Again, badass. I don’t know if you noticed the post on Tuesday but, I’ve had someone keeping me up late at night. That post was super short because I was on the phone for more than five hours. I don’t even know what to think of that! I woke up Wednesday morning with a weird feeling. It had been less than five hours since I spoke with this boy, and yet I was wondering what he was up to. Did he get out and get to work ok, or was he as tired as I was? Wait, really? It’s been less time since we talked than we were talking, and I have to stop myself from texting him right away. You guys, I haven’t actually met this man yet. I was talking to a friend about this yesterday, and I was pointing out that with the whole glitter shoes thing happening right now and the school thing (that I’ll write about tomorrow) hopefully happening soon, it isn’t exactly a good time for me to be falling for someone. That brought up a whole other issue though. I do not trust that “jellowy” feeling. And seriously, why should I? In my experience, those butterflies only lead to me getting hurt. There have been a couple of times that things ended ok, but there was still some burning before getting to ok. I didn’t have anything to say in response to that. It is kind of nice, even if I’m not getting much sleep. June is apparently the month of frustration for me. Even now, when I’ve gotten past the intimidation of the guy I mentioned a couple weeks ago, but there is other frustration coming from that source. We’ve both done some things that I believe the other has read into in unintended ways. As far as I can tell though, I have done what I could to figure things out and get back on the same page. I don’t think that he’s done the same. I’m not really sure though because we haven’t had a lot of time one on one to talk about stuff. I’m no longer intimidated by his smart and such, but I’m still just as intrigued and hopeful to be able to learn from him. At this point though, it seems that learning will be mostly platonic. This is the first time that I have ever experienced this awkward time where there was a possibility of something, and then it seems that things aren’t going to happen but there’s still a decent level of communication and I don’t feel anxious about seeing him at dodgeball each week. Sure, I’ll have the weird knot in my stomach because the crush is still there, but I’m sure that will loosen each week, if not by the end of this week’s dodgeball night. This isn’t how I thought that things would go. It’s not even the way that I’m wanting them to go. The thing is though, that I’ve done all that I can do. There’s no way that he can’t know that I like him. I mean, I’ve flat out told him that I like him. I’m pretty sure that he likes me too. I’ve put some pieces together for some reasons as to why he might not be taking action on this amazing chance acting on this mutual attraction, but to honor those excuses and wait around for him isn’t fair to me. I’m not going to do it. Especially when there are other boys who are interested in me. At the moment, I still want the intimidator, but he’s got to come after me now. I hope he doesn’t take too long. I posted on Monday about the boy I like being intimidating for really the first time in my life. Thank you so much for your support and the encouraging words that so many of you gave in response to the post. I don’t think that I was clear enough though. I like that he intimidates me. It would actually bore me a little bit if he didn’t. I don’t want to sound conceited in this, but whenever I’ve gone on a date with a guy and he’s seemed nervous (more often than not, thankyouverymuch), well I think I might actually understand that feeling a little bit better now. It’s not that I’m shaking or showing any other external sign of being any more than mildly nervous, but I definitely am more concerned with whether or not this guy is impressed by what I’ve got to say. Concerned isn’t the right word, at least not in the way that most people will read that. Aware is probably better. I will still talk to this gent on a date without hesitation, I’ll just be doing more nervous hair flipping than flirty. With a little luck, maybe I’ll be able to pass it off as flirty! But really, this is a good thing folks. It might even be a sign that this guy is worth my time. The others I simply wasn’t impressed enough by (or I’ve known him since I was 11 and therefore it would be silly to be intimidated by him) for it to really last. I have no idea what’s going to happen with this because I’ve never gone into a situation like this before, but I hope to at least have something to share with y’all along the way! I mentioned in a previous post that I’m dating again, and being the super analytical, introspective person that I am, I’ve thought a lot about it and realized something about how my tastes have changed, or maybe it’s my expectations that have evolved, since that big ol’ life altering break up last year. What I mean is that I’ve gone from dating boys who have great ideas and plans, to guys who are putting those ideas and plans into action. The Professor was the first in what I hope will become a trend. An as yet unnamed (but I hope he will be featured a bit more) guy definitely has a leg up on The Professor even, who is currently working on his Ph.D. in English. It’s a whole different ball game to be interacting with guys who are driven. It’s good for me, though it’s also terribly intimidating. It’s the intimidation that I’m feeling with just the thought of dating this guy that’s made me look back and realize that usually the guys I date have great ideas that they are sitting on. The Ex (as in THE ex) was a huge perpetrator of this offense. He had great ideas. Ideas that I loved, ideas that helped me to fall in love with him. Very few of these did he actually do anything about though. While a part of me hopes that, that changes as he finds relationships that suit him better, there’s a big enough part of me that knows better and isn’t terribly bothered by the fact that he doesn’t put much effort into his life. I now remember being so frustrated when I knew that he wanted to do things like write, but he never wrote. This is not something that I would like to repeat in the future. When I’m around guy, and people in general, who are like that, I tend to be like that too. I’ve gotten to know some really awesome and driven people through this wonderful world of the interwebs though, and I totally need to join their ranks. This intimidating guy (I guess he’s got a temporary name) has an awesome job, and he’s doing things and he talks about stuff that I don’t know about. All of which are things that only make me want to know him more. I like when I can learn something from the guy I’m with, or even just from friends that I know and I’m really hoping that this guy is willing to take the time to explain some things to me, because right now I’m having a hard time pretending to know about the current stuff he brings up. I’m a little proud of myself that I’ve admitted a bit when he’s talking about things I’m not familiar with, but I hope that I can pick it up quick! Do you ever experience this? Do you tend to be the smart one in your relationships? *Now don’t get me wrong, I don’t actually believe that true men exist, but that’s a totally different post. I’m dating again. I mean, I know I’ve been doing the online dating thing for a few months now, but honestly, I wasn’t really ready to be dating when I started that, and for the most part I have not been too impressed with the guys on there. * There was The Professor, and I guess what we did was date, but not only did that not work out, it was kind of rushed and really just a mini relationship. Very little courtship was involved. 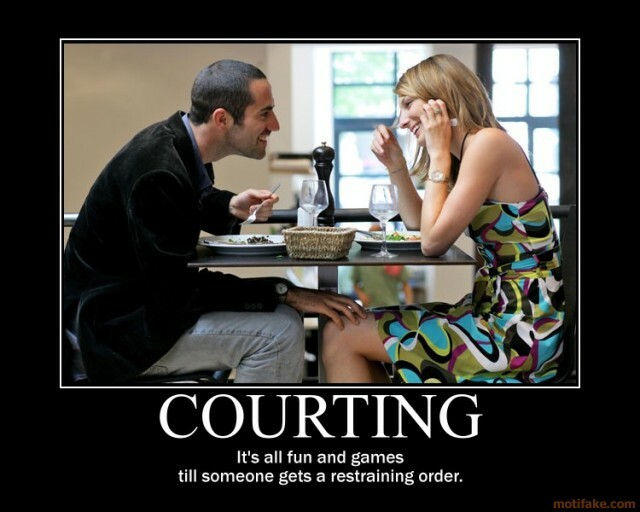 I like courtship. I like it quite a bit actually. I like the practice of getting to know someone, and intentionally dressing up to see him, even if we’re just sitting on the couch watching tv. I like playing that game where I pretend that I’m ok with paying for my portion of the meal. ** I like flirty texts and wondering when I’ll get to see him again, though I don’t like having to try to figure that out. I like seeing him be a little nervous, but I always hope that goes away a bit by the end of our first meeting. This is the part that I’m ready for again. It actually surprises me a little bit that I’m less than three months away from 28 and I haven’t experienced much of this courtship style of dating. I tend to jump right into the comfortable part. While the comfortable part is great and all, the butterflies tend to disappear pretty quickly. I like the butterflies. Did I not mention that before? I actually have some butterflies right now while I sit in the park on a Wednesday (as in before dodgeball) writing this. There’s a chance (though I’m pretty sure it’s a small one now) that I will be seeing a boy tonight that I’m starting to like. Update before posting: Did see him, didn’t talk to him for what turns out to probably be silly reasons. Looks like I’ll be going direct with this boy. I’m ok with that, I’m good with direct. I just have to calm the butterflies a little bit. *If you’re a guy who I have met who is on that site and you’re reading this, I promise you don’t qualify to be in the group mentioned here. **For the record, I will never go somewhere that I can’t pay for, but I’ve got to be seriously into you if you ask me out, make me pay for my own meal and then we go out again; and I don’t recommend you use that as a test to see how much I like you. ***Nah, I already know I’m not good with it. That’s why I jump to comfortable, that’s what I know! Sorry for all the butterfly talk Ashley, I promise there are no actual butterflies involved in the process. 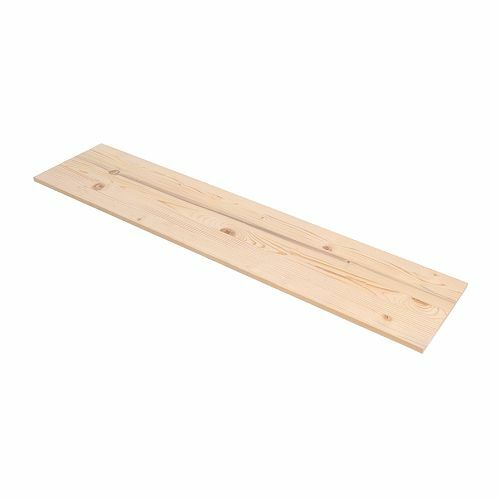 Tonight I went to Ikea. I don’t do Ikea the way that most people do. The first thing I do is check out the as-is section. I’m not exactly clumsy, but I’m not exactly not clumsy either, so I don’t mind buying slightly nicked floor models at discounted rates! Plus, there’s all sorts of stuff to be found there that’s made for the DIY crowd. Lots of cabinet doors and the like that I would love to have time to really play with! Perhaps this summer! Anyway, remember when I wrote about the awesome dressers I bought to remake? Oh, wait, I only tweeted about it. 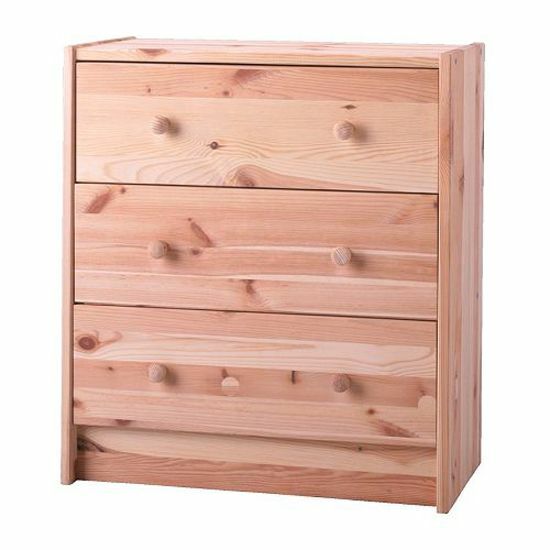 Pretty much I’m going to do one of the Ikea Rast Dresser makeovers that are totally all over the DIY blog scene. 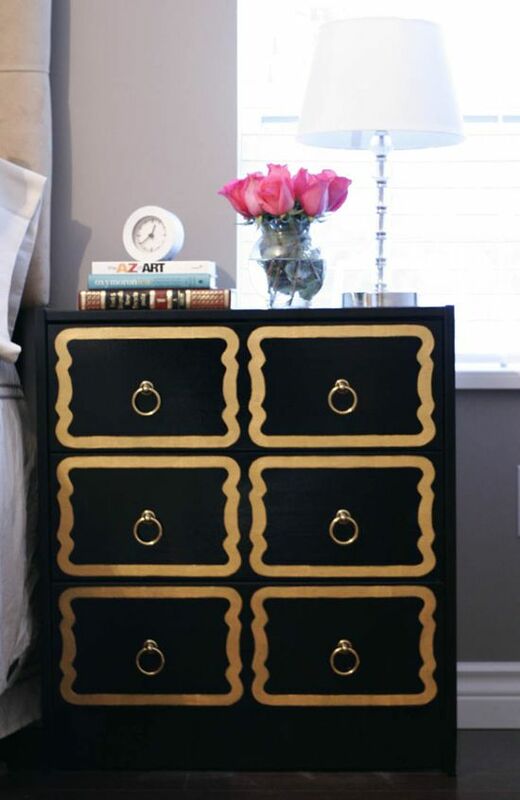 Ya take a $30 dresser and turn it into something that looks like you paid 3 times as much for it! Those aren’t the colors I’m going with, I’ll share more when I’m ready to work on them. This will probably be after Vegas. This is just another reason to be excited for graduation! For the record, I’ve already bought 2 of those dressers. They are sitting in storage, just waiting for me to have my brother lift them back into my trunk and then bring them upstairs for me to work on! After buying them, my mom found my lost wallet, which had an Ikea giftcard with about $75 left on it! So tonight I went to Ikea! It was on my way home from hanging out with The Professor and I had that giftcard just burning a hole in my pocket. Nothing in the as-is section for me today. There were some possibilities, but nothing that I needed for my current situation and it does me no good to keep something in storage right now. I could definitely use a shelf to organize some things in my room right now though, so I went to check out what they had. I was rather happy with this. I plan on staining the sides and top of the dresser, and when I do that I can take down this shelf and stain it the same hue! Don’t know what I’ll do for the brackets yet, but I can do just about anything! My total for the night was just over $35, and I still have just over $40 on the card! Now what should I get?! The past nine months have not exactly been fun when it comes to emotions and having to deal with them and all. Nine months ago I was absolutely, positively head over heels in love. I would have hopped a plane to Vegas had the idea been suggested, whether I had the money or not. All that really mattered to me was the man that I was with and the fact that I could do anything as long as he was by my side. I was totally ready to marry this man. He wasn’t the man he had tried to be while with me though. The story of the breakup is not one that I want to get into detail with here. For those who stuck through the months of not-so-me tweets and postings, thank you. The rest of you aren’t really here to read this, and I’m getting off my topic anyway. Part of my troubles with getting back to myself is that during my relationship with Shadow Boy* I grew to a point in which I became ready for marriage. After the breakup, I was still ready to be married, but the person I wanted that to be with was not an option. Dating isn’t exactly easy when you’re already in a place that you’re ready for a ring though, because it’s hard to just get to know someone slowly. I don’t know that I could possibly explain myself adequately, so I’ll settle for inadequate and vague! I know that I want to take time to get to know someone, but at the same time, I already want to be at that comfortable stage where sitting at home reading for homework or writing an essay is still awesome to be doing together. When thinking more about it, I realized that it’s not going to be easy to be ready to “settle down” while also trying to date. Dating is supposed to be adventurous and exciting, while the phrase, “settle down” is just the opposite of that. (That’s not to say that people who are married are not having adventures, in fact I know that to be the opposite!) While thinking about this at work the other day, I was struck with an idea. I’m ready to be married, and I need to be taking care of myself right now. So why don’t I just marry myself? I mentioned it to an awesome co-worker, and she totally understood without me having to explain. I think she might do the same, which is awesome because now I’ll have a non-couple to double date with! We’re actually going to check out Sacramento Magazine‘s 10 Best Cocktails and discuss life and such some time this week. Perhaps after we do that I’ll be able to let you know a little more about what I mean with this whole marrying myself kind of thing! *I know that I had changed his name, but considering how things turned out and why, I think I was right about him from the beginning. …and ladies don’t kiss and tell. The original plan to meet The Professor on Tuesday didn’t really work out. It would have been a little too forced and probably not as much fun as we were wanting. We’d originally figured we’d find time to get together either today or tomorrow. Then, when I was having drinks with my dodgeball team last night, Dr. Horrible’s Sing-Along Blog was brought up. The Professor and I had talked about how he needs to see that, but I wanted to watch it with him. Dr. Horrible is the kind of thing that I really want to watch when it gets mentioned, so we ended up hanging out after I left the bar. It was awesome, and that’s all that you really need to know. We’re going out tomorrow to see Source Code and have some food. I’m excited. To be 100% honest, I mostly wrote this because he likes being mentioned here. There won’t be too much shared, I’d rather just let it happen. Besides, most of you reading this can probably get a real life conversation out of me about it in Vegas in May! The Professor or Mr. Hyperbole? It’s almost 3:30 in the morning. I got off the phone about an hour and a half ago and I haven’t had any caffeine today, but I’m still awake. Because I would like to let you know that the date I had tonight was fine, but neither of us is truly interested romantically. Fortunately for both of us we were really honest about it and we both have someone else that seems to have more potential for us. I never really even got to use his nickname though! That name would be Target Dog, since he, you know, has a Target dog. I’ve been talking a lot with a guy who is on spring break and out of town. It’s been kind of awesome and I really hope that our first meeting goes as well as our phone conversations. I’ve been having a rough time coming up with a blog name for him, though I actually asked him if he had any recommendations/preferences if I were to ever mention him. Tonight I came up with two! He can either be The Professor or Mr. Hyperbole. No, he is not one of my professors. Do you really think that I would be posting about it publicly if he was? He is currently studying for his PhD in Literature at a local school though. Awesome, right? The hyperbole comes into play when he likes to talk about everything like it’s the best thing ever in the world. Totes normal, I know. So, knowing nothing else about this guy, which is a better name to use?